After achieving Gold with his single ‘Love The Fall’ singer songwriter Michael Paynter has opted the indie route for his new album ‘Weary Stars’. These past few years have seen Paynter on the road and in the band Icehouse as well as recording his own record. Michael has recorded with The Veronicas, toured with Miley Cyrus and had a song used in the promo for ‘Lost’. 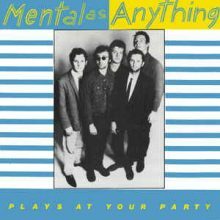 Mental As Anything’s extremely rare very first release ‘Mental As Anything Plays at Your Party’ has been given a limited vinyl release to mark its 40th anniversary. When Sunnyboys regroup for By The C in January it will mark an annual tradition they have kept since 2012. The Church song ‘Too Fast For You’ rarely makes it to the band’s compilation albums, it is not available on streaming services and Steve Kilbey has no idea why. The Church has joined the By The C line-up for Newcastle, Wollongong, Coolongatta, Geelong and Adelaide for 2019. Icehouse fans can flip across to the official website and download a sing-a-long. The all-new Beyond The C music festival line-up has just gone on sale with an astonishing 80s Oz Rock mob headlined by Icehouse.